Good afternoon! As it's the last day of 2012, it seems like the perfect time to go through my sewing plans for the new year ahead. My sewing mantra for the year is very simple and can be summarised in three words: SEW MORE DRESSES! I love dresses: I love planning their construction, I love making them, and most of all, I love wearing them so more dresses it shall be. - Two pairs of trousers. One using Simplicity 3688 with the Margaret Howell "trousering" and one pair of Colette pattern Juniper trousers with a nautical spin. And that's it! I don't like making rigorous sewing plans so we'll see what else turns up along the way. I did a Hula Hoop class a few weeks ago and was hooked. Father Christmas brought me an exercise Hula Hoop (weighted for extra fat burning and consequently a bit of a killer) so bring it on! I'll be whittling my waist down so I can actually zip my dresses up, having eaten more than my fair share of pies over the festive period (ahem). As we approach the end of 2012 I want to take a little look back through my sewing year and decide what worked and what didn't, what I loved making and what was a disaster. But before I get onto that, can I just say a bit thank you to everybody who took the time to comment on my recent post about my son Charlie. I didn't respond personally to each comment as I'm a notorious softy and would have been a snivelling wreck within minutes. But I want you to know that I truly appreciated each and every one of your thoughtful and honest comments. Thank you again. A surprising fail - I've only worn it a handful of times, maybe because it's a bit black and work like? I don't know, it just feels a bit formal for everyday wear and having scrambled to make an essential black item, I've now realised I don't really suit black…. The least worn of my three Gingers, a nice fit, but the jury's still out about wool crepe, I'm not convinced I actually like this fabric. My perfect skirt which consequently has been worn a lot. Three Peony dresses, blogged here, here and here. A great pattern for me as all three versions have been worn a lot. The neckline has been lowered slightly on each make with the most recent one hitting the jackpot! Love it and wore it to death all through the summer. Another love story, but this one is a little more dressy so has been worn only a few times. I'm sure it will be my go-to going out dress this summer. I loved making this dress, but as revealed in my last post, this dress has never been worn. Just the wrong type of dress for my lifestyle I guess. And the fabric doesn't float my boat much either. I don't regret making it though. Only just been born so still unworn. 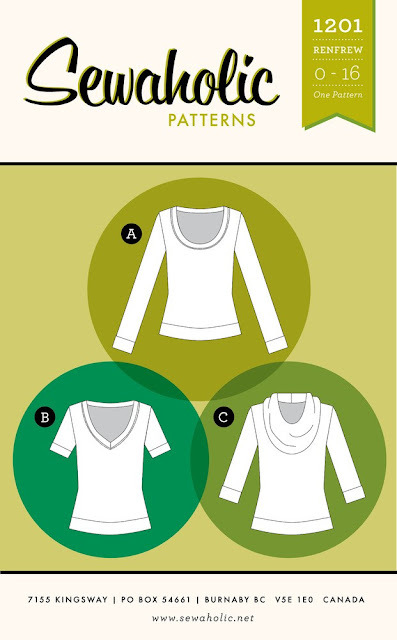 Eight tops, including two plain knit tops (Renfrew and striped Burda top), and four with collars. Most of them have been a success and have been worn in rotation over the warmer months. The ones that haven't quite worked are the kimono wrap top (too much of a fiddle to wear) and the Portobello curtain blouse. The Portobello blouse has some fit issues that didn't become apparent until I'd worn it, plus it only really seems to look good with my denim Ginger skirt which limits how often I can wear it. Two pairs of PJ bottoms that have been worn regularly. This wins the prize for most-worn garment. Every day the weather was appropriate, this coat was on my back. It's also the garment I'm most proud of making this year. 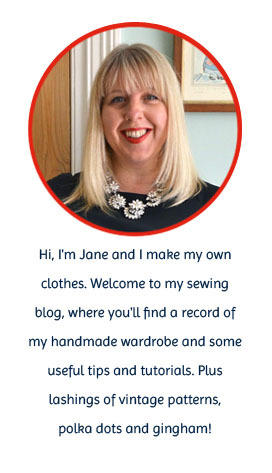 So what lessons have I learnt from my sewing this year? 1) Just because you have a garment sized piece of leftover fabric in your stash doesn't mean the resulting garment will be a success. If you're just making it for the sake of using up the fabric what's the point if it's not going to be worn? Much better to save the fabric for something perfect, even if it takes a while to make itself known to you. Or donate it to another sewist - your leftovers may be another sewists dream fabric! 2) If I can perfect the fit on a pattern e.g.the Peony, then I'll make it again and again. 4) Buttoned vintage-style blouses with collars seem to be the best type of top for me. The same goes for shirt dresses. Happily, I have lots of pattern and fabric plans for 2013 that will fit right in with this. 5) It's OK to make things for fun and to learn new techniques (see Mad Men dress) if the fabric doesn't cost a lot. 6) It's also OK to spend a bit more on a carefully thought out garment that you know you'll get a lot of wear out of (Liberty lawn tops, polka dot cord). 7) I love dresses and wear them a lot so will definitely be making more of them in my next sewing year. All in all I'm very happy with what I've achieved this year. I've become much more confident in adjusting patterns and adding my own details. I hope this continues with my next year of sewing. Thank you for your invaluable support, advice and friendship this year. One thing I've learnt that isn't in the list above is that the details of sewing don't matter too much, as long as the process keeps you happy. Well, my sewing has given me a massive amount of pleasure this year and has definitely kept me happy! When Eliza M contacted me recently asking if I wanted to try out one of her vintage inspired patterns, I was intrigued. As the name suggests, the patterns all take their influences from vintage designs and, like vintage patterns, you choose them according to your size rather than having one multi-sized pattern. Ooh, yes please! There were a lot of gorgeous patterns to choose from, but I was looking for something a little bit different (for me) that was also dressy. The Ruby wiggle dress seemed to fit the bill on both counts. 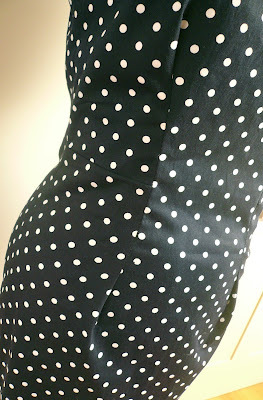 For fabric, I used a navy polka dot stretch cotton from The Fabric Godmother. A fabric with a bit of stretch is recommended for the Ruby dress, so this was perfect. It also comes in black and, wait for it, red, hmmm. Yet again, the quality of the fabric was excellent and it behaved itself perfectly during the whole process. 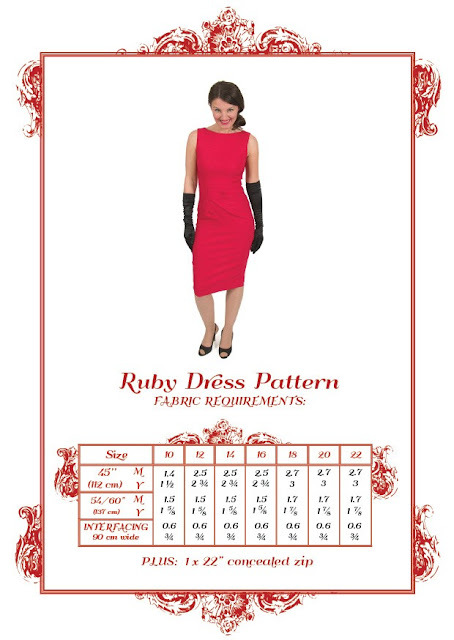 To give an indication of size, I went with a size 12 and the fit was fine, no adjustments needed, apart from the length - the Ruby dress is below the knee which is authentically fifties but too long for me. The design of the dress is very clever. To give shape, it has quite large contour darts at the front and back and a waist dart. The waist dart looks just like a bust dart but it's at waist level. It nips you in, and the top of the contour dart gives some shape to the bust. I've never seen this kind of dart before and I must admit, I quite like it. Because the stretch cotton tends to cling and I was in no mood for facings, I decided to add a full lining. Adding a lining gives a much neater finish and you get an extra slinky layer. There are no instructions for adding a lining in the Ruby pattern, so I used the instructions for lining the Truffle dress in the Colette Sewing Handbook instead. Talking of pattern instructions, they were a bit sketchy for my liking. But that's probably because I've come to rely on the comprehensive instructions that a lot of pattern companies tend to supply these days. The pattern is classed as suitable for a beginner, but I think if you've had very little sewing experience then some of the instructions may be a bit brief. The cut and sizing were spot on though and it came together very quickly. So, what did I think of the Ruby dress once it was sewn? Well, first of all, I need to reveal a shocking confession. Remember my wiggle shirt dress that I made for the Mad Men Challenge back in March? I'm afraid it's never been worn. I know, what a waste! I loved making it too, but it was just too tight and clingy for everyday life and too officey for wearing in the evening. As that's the only other wiggle dress I've made, my practical experience of wearing them is zero. Let me tell you, the Ruby dress is a proper wiggle dress, it's so tight, you can't help but feel like Jessica Rabbit in it (this is where the stretch fabric really comes into its own) and you really can't walk in the normal fashion, you have to wiggle!! ... and I've even taken the precaution of testing it with my favourite red wedges to see if it's suitable for summer wear. It passed the test, but couldn't be modelled for you today as I wanted to spare you the sight of my English winter-blue legs. Thank you Eliza M, I think we've got a winner here! The Ruby pattern was given to me free of charge for review. All views my own. In the meantime, I thought I'd do a round-up of gift ideas. Tilly's post on sewing related gifts, pretty much nailed it, so I thought I'd concentrate on vintage inspired lovelies, either for you, or the vintage loving gal in your life. 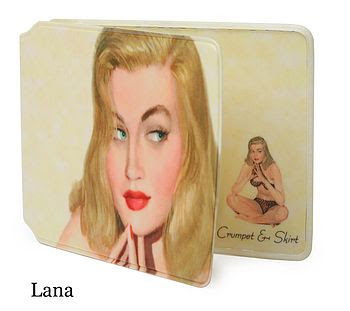 Glide through that travel barrier with style, with a pin-up girl travel card holder. 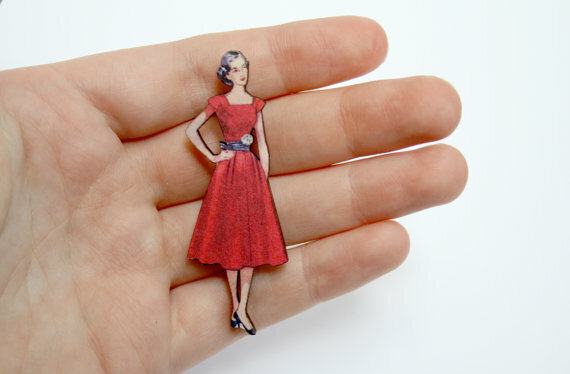 I love everything in Ladybird Likes' Etsy shop, but do have a soft spot for these cute little vintage fashion lady brooches. Whilst we're on the subject of vintage fashion ladies, how about a Vogue pattern necklace? 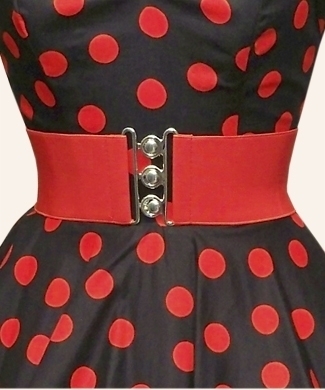 I already have one of these three-inch waspie belts from Vivien of Holloway and can testify to its awesomeness. They cinch you in and give you a waist, even if you've forgotten you have one! I searched for years for a cherry brooch before finding one at the Vintage Festival a couple of years ago. 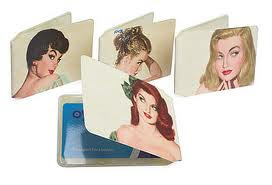 I've since discovered that you can buy them here from Vivien of Holloway, hoorah*. It goes with everything and glams up any outfit. Fancy slinking about in a wiggle dress? 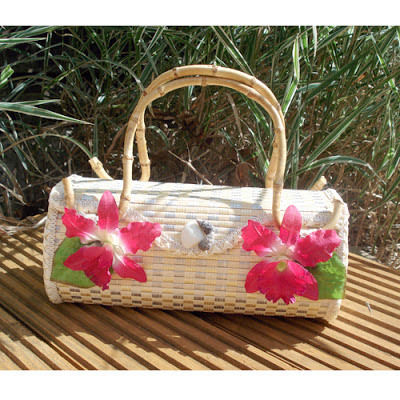 This bamboo handbag should complete the look. Isn't it gorgeous? And finally, a Hollywood robe from What Katie Did is right at the top of my Christmas list. Swan around like a screen siren whilst you do the washing up. SSSOOO glamorous! Check out their lovely vintage style undies whilst you're there too. As you may, or may not know, my younger son - Charlie - is autistic. Bringing up a disabled child is challenging at the best of times, but especially when your child is upset and can't communicate to you what's wrong. Thanks to his amazing school, this has been getting easier and easier for Charlie as he gets older and acquires more language. But sometimes he just wants comfort and reassurance, and that's where Raggy comes in. Raggy is his comforter that he's had since he was born. My older son had one exactly the same and Charlie's Raggy was the 'spare' that his brother rejected. 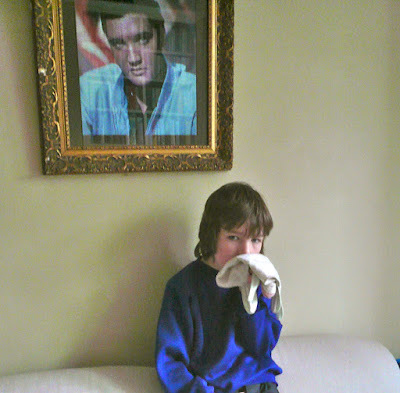 Raggy is like a wonder drug - he sleeps well at night with him beside him (a massive bonus for any parent, whether your child is autistic or not) and he just seems to calm him down and keep him happy, which for me, is the number one priority. However, eight years of non-stop stroking against the face have taken their toll and Raggy has been in need of some serious repair work. A few weeks ago, his face actually fell off (!) so he now sports a piece of cotton wrapped round his face with eyes drawn on. A bit like the disguise poor old John Merrick had to put on whenever he went out in public. As you can imagine, washes are few and far between, so it got to the point where Raggy was actually becoming a health hazard. Measures had to be taken. When he's fallen apart before, I've always sewn a flannel (face cloth) over the existing square, but these were gradually disintegrating. I need to actually remove the head and fit Raggy out with a complete new coat. I bought some lovely soft cotton flannel from the Goldhawk Road and used the edges of a face cloth to make the all important twiddly bits on the corners. I then temporarily wrapped the whole thing in the old rags, hoping that some of the old aroma would be picked up. Charlie is very sensitive to smell so this was an important point. We'd prepared Charlie by telling him Raggy was getting a new coat that day so we just had to keep our fingers crossed as to his reaction. This is a quick alert for all you knit/jersey fabric fans out there. Josie at The Fabric Godmother is giving away a Renfrew pattern, along with a length of Roma jersey in the colour of your choice. Hoorah! She was inspired to make her own Roma jersey top after seeing it featured on my knit dress post. Having sewn with it, I can personally vouch for its awesomeness!